Shavuot begins at sundown on May 26. How do I get my kids excited about it in advance? Shavuot, the next major Jewish holiday after Passover (and considered of equal importance in Jewish tradition to its more famous predecessor), often seems like an afterthought. An informal poll of the students in the Introduction to Judaism class that I teach at the J revealed that, while all of them had heard of Passover prior to taking the class, none of the non-Jewish students and only a very small fraction of the Jewish students had even heard of Shavuot, let along ever celebrated it in any sort of way. And from a parenting perspective, Shavuot can be quite a tough sell. Passover provides all sorts of fun and meaningful ways to involve children, but Shavuot lacks the intense preparatory requirements, the striking shift in eating habits, the ritual banquet, and the dramatic narrative. Four weeks after Passover and with just over three weeks to go before Shavuot, my kids are still obsessed with the Ten Plagues and the parting of the Red Sea. But I have yet to engage them in the stories associated with Shavuot, either the actual receiving of the Torah on Mount Sinai (they like the thunder and lightning part but don’t really connect to the rest of it yet) or the story of Ruth and Naomi traditionally read in synagogue on Shavuot. Furthermore, the main observance associated with Shavuot, the all-night study session known as a tikkun, happens after their bedtime. And they love blintzes and cheesecake, but no one seems to know exactly why those foods are associated with Shavuot, so it’s not as meaningful an inroad to discussion as say, horseradish or haroset. But since feeding my kids seems to be the most effective way to accomplish anything in my house, I decided this year to try to build excitement about Shavuot through the seven types of non-dairy foods traditionally (and more explicably) associated with the holiday. The Torah describes the Land of Israel as “a land of wheat, and barley, and vines, and fig trees, and pomegranates; a land of olive oil and honey (Deut. 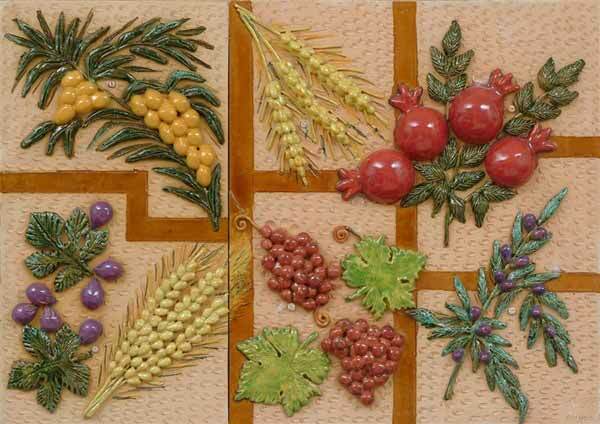 8:8)” and these seven species were the harvest fruits historically brought to the Temple as sacrifices on Shavuot. With one quick post-work trip to Whole Foods, I was able to set up a little Shavuot Seven Species tasting menu on a random weeknight (added bonus: I didn’t have to cook anything for dinner that night!). The kids loved the bread rolls, grapes, figs, olives, and honey sticks; they were iffier on the pomegranate seeds and mushroom barley salad but were good sports about trying them. More importantly, they loved the novelty of the evening and seemed to more or less understand the connection to Shavuot. And they are now looking forward somewhat more eagerly to the actual holiday, when I’ve promised them a reprise of the tasting menu (plus cheesecake!). Like most parents I know, I generally feel that I’m doing a pretty mediocre job of balancing the competing demands of young children, work, household responsibilities etc. This feeling often gets exacerbated around Jewish holidays. I would love to be the kind of Jewish Supermom who comes home from work, engages her children in meaningful discussions of the upcoming festival (complete with relevant Hebrew vocabulary and a craft project or two), and then whips up the perfect holiday feast from scratch after they go to bed. Sadly, this is far from my reality. Time is scarce, life is busy, my kids don’t particularly enjoy being engaged in meaningful discussion, and, although generations of families who have taken my classes at the J’s Parenting Center might imagine otherwise, I actually hate doing crafts projects at home. So I tend to limp across the finish line of each holiday, trying at least to read one seasonally appropriate book (usually courtesy of the PJ Library, a fantastic resource) and maybe teach the kids one song that fits the occasion so that they can make me look good in front of the grandparents. 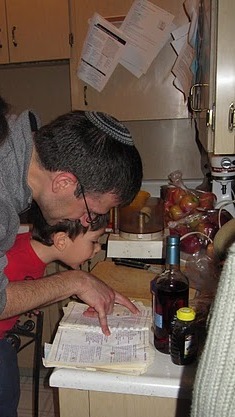 But my challenge to myself this year is to find low-stress but more hands-on ways to engage my kids in the lead-up to each holiday, and specifically, right now, to involve them more meaningfully in preparations for Passover, which begins next week. Now, I have the serious advantage of having my children at the J’s preschool, where they do Passover-themed art projects, learn songs, and even have their own Seder. And the Seder itself presents many great opportunities for kid involvement, from the Four Questions to Ten Plagues to the afikomen hunt. But how to make them active participants as we get ready for Passover at home, given the huge demands that the preparations already place on my own time and energy? I’ve set small goals – to involve the kids in at least one or two preparatory activities and to sneak in some meaningful discussion along the way. So this week, they are “helping” me clean the house for Passover by spending a few minutes after school each evening sorting through the toys in their toy bins and making a (so far very small) pile of stuff that they no longer play with. It’s not a tremendous amount of help, but it does make them feel invested in the process, and it gives us a chance to talk as we work about the Passover story and why we clean out all of our chametz. And in the frantically busy day leading up to the first Seder, I will try to find at least 20 minutes for us to make haroset together, using an easy recipe like this one. While we watch the food processor grind, we might talk about why we put haroset on the seder plate, and hopefully that will lead to a discussion of the symbolism of the other seder plate elements as well. And if I need to keep the kids occupied while I get some other cooking done, having them color in printable seder plates like these will give them something of their own to contribute to the Seder table. (This doesn’t count as a crafts project in my book – I can handle crayons as long as there is no glue or paint involved). Hopefully, this year, I will feel like I’ve guided my kids into the holiday with a bit more intentionality. I may not be the Jewish Supermom of my dreams, but it’s a start. For lots more fun and easy ways to involve your kids in the celebration of Passover, check out the Partnership for Jewish Life and Learning’s Passover resources page.